In the public services of the synagogue, the men occupied the main floor, whether in seats, or on the floor (the seating arrangements for women will be treated later). Both kinds of seating arrangements are noted in James 2:2-3, where it is a gold-ringed man (Greek aner) who is granted a seat in this Christian synagogue (the very word James uses in the original), while the poor man is directed to a spot on the floor. 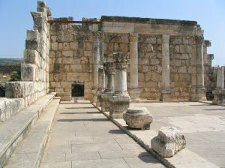 Jesus also spoke of the chief seats in the synagogue which were highly prized by the Pharisees (Matthew 23:6). When Paul and Barnabbas entered the synagogue in Pisidian Antioch, they sat down, which may be assumed to be on chairs rather than on the floor, since they were treated as honored guests shortly thereafter and were invited to address the synagogue (Acts 13:14). Inasmuch as one of the synonyms for sunagoge is prosuche (that is, “[place of] prayer”), it is no novel thing to expect prayer to be a significant activity in the synagogues. That prayer was practiced in the first century synagogues is expressly taught by Jesus when he says of “the hypocrites,” that “they love to pray standing in the synagogues and on the street corners” (Matthew 6:5; emphasis added). A detailed system of prayers and blessings was part of the prescribed synagogue service by the second century and no doubt this had its roots in earlier times, but it is notable that other than the one specific mention by Jesus of prayer in the synagogue, the Gospels, Acts, and NT Epistles are silent on the matter. The customary Jewish practice was for the men to pray veiled, that is with a shawl on their heads, apparently as an emblem of humility and submission to God, while the women in the synagogue were customarily not veiled, though when in public such veiling was rigorously practiced.6 Women seem not to have prayed publicly in the synagogue. Prayer has a very prominent place in the life and teaching of Jesus, as well as in the lives of the Apostles. It is no surprise that there is repeated NT notice of prayer in the churches. The assembled 120 disciples were united in prayer in anticipation of Pentecost (Acts 1:14). The three thousand who were saved on Pentecost were soon joining in on these corporate prayers (Acts 2:42). After the release of Peter and John following their first arrest, the believers united together in a prayer of praise and supplication to God, with phenomenal results (Acts 4:24-30, 31). The church later prayed earnestly for imprisoned Peter, and was amazed at the answer of God (Acts 12:5, 12-16). The congregation in Antioch prayed before sending out Paul and Barnabbas as missionaries (Acts 13:3). Paul and Barnabbas fasted and prayed over the elders who would lead the newly-established churches in Turkey (Acts 14:23). After Paul spoke to the Ephesian elders, all knelt down and prayed together (Acts 20:36). There is nothing in these accounts to suggest that the prayers were anything other than extemporaneous, spontaneous prayers. In contrast to the Jewish practice of the men praying covered, Paul expressly rejects this practice in the church in Corinth and enjoins the practice of men praying and prophesying with heads uncovered, while the women are to “pray and prophesy” with heads covered (I Corinthians 11:3-16). 2 Cf. 3 John 5-8. 6 John Lightfoot, A Commentary on the New Testament from the Talmud and Hebraica, vol. 4, pp. 229-233, where he cites a number of Jewish sources to establish this fact. See also John Gill, Gill’s Commentary, vol. VI, p. 222. This makes well the point that the Word was central in the synagogue, just as the Word should be central in the church. We shouldn't just play with the Scriptures or read them as part of meaningless ritual; we need to study (there's a word no longer used in many churches) the Word.